Powers/Abilities: Warwolf is not a typical lycanthrope, in that his transformations are triggered by Mars instead of the moon. He can apparently transform at will when Mars is in the night sky (thus able to transform every night instead of two times a week like normal werewolves), and retains his human intelligence and speaking abilities. He has military training, including field leadership, tactical abilities and the use of firearms and high-tech flying vehicles. In his Warwolf form, he possesses keen senses including sight (in the dark) and a strong sense of smell. His endurance and reflexes appear to be at least peak human if not superhuman. At times, Warwolf appears to have four horn-like protrusions near the front of his skull. Their occasional appearance, and occasional lack thereof, may have something to do with the strength of his connection to Mars on a particular night. History: (Nick Fury's Howling Commandos#1) - As team leader, Warwolf led the main Howling Commandos unit in a surprise assault against a Lords of the Living Lightning base located in Afghanistan. Infiltrating the base, the team was successful and shut down the Lords within mere minutes. With the situation contained, Warwolf called SHIELD for "mop up" procedures. As the Commandos stood by and watched, SHIELD agents took over the operation, barely acknowledging the monsters' existence or efforts. Soon picked up by their personal "carrier" the dragon Grogg (piloted by "Buzz"), the team returned to their home base to meet their new commanding officer, Clay Quartermain. (Nick Fury's Howling Commandos#2) - Warwolf and his team located the fugitive alien Groot, drawing him out of hiding. As they fought him, Warwolf gave the command for It the Living Colossus to engage Groot. After Groot was defeated, Warwolf and his team stayed on the premises while SHIELD agents utilizing Living Eraser technology "erased" Groot back to their Area 13 holding cells. 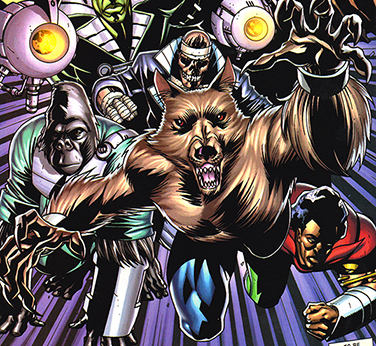 After returning to Area 13, Warwolf (in his human Vince Marcus form) and Gorilla Man discussed Quartermain's noticeable disdain for the team as the two made their way to a unit housing the team's newest recruit, the Glob. They proceeded to take the Glob on a tour of the facility while explaining their mission. As they did, Brother Voodoo teleported into their path, panicking and in pain. As Marcus tried to calm him, Voodoo rambled about someone (Merlin) trying to return the dead to Earth. (Nick Fury's Howling Commandos#4) - As Merlin had begun to turn the United Kingdom into a fantasy realm, Marcus, Brother Voodoo and Bradley Beamer discussed the situation in an Area 13 bar. Beemer explained that two Commandos - Vampire by Night and Lilith - had been sent undercover to join Merlin's forces, but SHIELD had lost contact with them. Voodoo immediately realized the severity of the situation, as neither vampire had been prepared and shielded against Merlin's fairies, which could read minds. The three took the information to Quartermain, and as they tried to explain to him that Merlin was very likely aware of Area 13, a portal opened within the base, allowing Merlin's forces to push through in an assault. 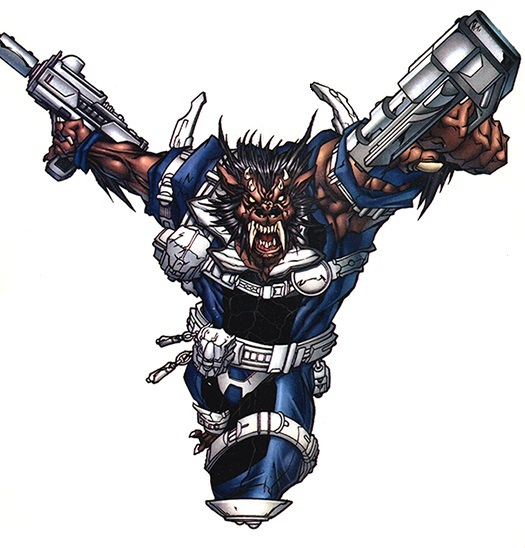 Marcus transformed into his Warwolf form and, with most of his team nearby, led them into a defensive attack. (Nick Fury's Howling Commandos#5) - Battling Merlin's forces, Warwolf ordered Living Mummy to take Quartermain out of the battlefield, much to Quartermain's chagrin. Warwolf and Gorilla Man then formed a plan to release all of the "exotics" - the giant monsters and aliens housed within the base - and let them run loose. Using themselves as targets, the Commandos led the angry giant monsters through the portal, driving back Merlin's forces in the process. Once on the other side and now in the transformed England, the team reconvened, with Warwolf bluffing one of Merlin's agents that he had the ability to call back the giant monsters (which had run off into the nearby lands). Deciding to take the fight to Merlin, Warwolf and his team began tracking the retreating army using Warwolf's sense of smell. As they did, they encountered Groot, one of the "exotics" who took part in the stampede. Warwolf accepted Groot's offer to help them, as he was tired of running and hiding. The team soon located their undercover member Vampire by Night, who had been outed and left for dead by Merlin. (Nick Fury's Howling Commandos#6) - The Commandos arrived outside Salisbury, Merlin's main camp. As they weighed their options, Warwolf picked up a scent and recognized it as Brother Voodoo, who had arrived to alert them of Quartermain's plan. Voodoo explained that other Commandos with mystic powers were restoring much of the land Merlin had transformed. Just after, a portal opened and the entirety of all Howling Commandos units pored through. When the Mole Man, in a temporary alliance with SHIELD, used one of his machines to lift the ground around Salisbury out of its foundation. Alerted to the Commandos' presence, Merlin's forces attacked. As the two sides battled, Warwolf and Gorilla Man made their way into Merlin's camp via Grogg and found him standing over the ashes of Lilith. Merlin did not fight them, explaining he had used Lilith's ashes to see into the future and that he would be defeated (unbeknownst to him, Lilith was still in control of her ashes and willed this). Merlin asked why the two, who were of his kind, would not join him. They refused, and Merlin teleported away, vowing to strike another time. Due to the rotating art team every issue, Warwolf's appearance, like all the other team members, varied drastically with each issue. A few times, mostly covers, he had gray fur instead of brown. 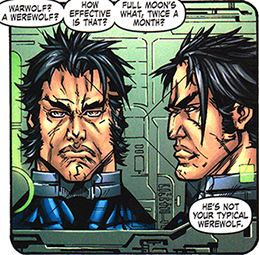 By the end of the series, his appearance became much more traditional werewolf as opposed to the somewhat demonic version introduced at the beginning. You'll notice Warwolf's real name is Vince, not Vic. Many online sources refer to him as Vic, or even Vince "Vic" Marcus. I believe at one point, he was referred to as Vic in interviews, but the only times his real name is used in the series, he calls himself Vince, so for now, I'm leaving "Vic" out until I have confirmation it is in-canon.